Good Life Fest 2012 will take place 27th of October. The tickets in presale are 10euro and you can order them here. 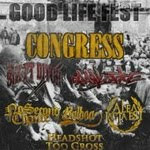 Confirmed bands are Congress, Six Ft Ditch, Crawlspace, Alea Jacta Est, No Second Chance, Balboa, Headshot, Too Gross and xViciousx. More info on Facebook event page.